The iPad mini is growing increasingly popular among retailers because of the capabilities it offers in conjunction with the smaller size. 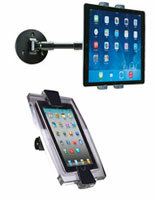 This selection features countertop, wall mount and floor standing iPad mini mounts to give business owners numerous options when considering how to utilize their iPad. Stores often set up iPad kiosks as a medium for customers to pay for products, enter contests and browse production information. Restaurants often use countertop holders as a checkout station. Many apps and softwares are available to streamline any business's checkout process and collect data. The right stand or countertop holder is the key for any business to get the most out of iPad Minis. Who uses iPad mini stands? Retailers - Setting up a promotional stand where customers can browse through a gallery or read promotional items about a product is an effective way to increase sales. Restaurants & Delis - Tablets as cash registers are becoming increasingly popular across all industries, but most commonly the restaurant industry. Employees can punch in an order and it will be sent directly to the kitchen, and then can swipe the employee's credit card. 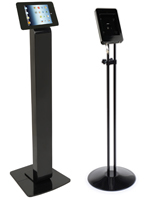 Trade Show Exhibitors - Place an iPad mini kiosk in the booth to give visitors content to browse through or watch while waiting to speak with a representative. Residential Use - Set up a personal stand to watch movies, look at recipes in the kitchen, or read a book or magazine while you watch TV. Why do many users prefer the mini over standard sized tablets? The smaller size still provides all the benefits and usability of standard iPads, but is much more portable and can easily fit in a large purse, satchel or laptop case. 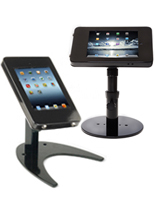 Retailers know counter space is invaluable, and using an iPad Mini stand is a great way to save even more space. Store owners can still use an app for ringing in orders and taken payments, while leaving extra area for promotional materials like business card holders, gift card displays and brochure stands. Many people use these stands residentially as well! Curl up on the couch and put a movie on the tablet. Is meal prep getting a little too messy and you're having trouble reading the recipe? Use a mini tablet stand in the kitchen to read a recipe hands-free while preparing meals. Also try putting a stand up by your bedside to watch Netflix and read at night.